OAKLAND, CA - JUNE 13: LeBron James #23 of the Cleveland Cavaliers reacts against the Golden State Warriors during the second quarter in Game 5 of the 2016 NBA Finals at ORACLE Arena on June 13, 2016 in Oakland, California. OAKLAND, Calif. (AP) — So much noise surrounded LeBron James heading into Game 5 of the NBA Finals. It came from the Golden State Warriors players, who chided James for being overly sensitive to trash talk in the heat of the moment. It came from raucous Oracle Arena, one of the loudest fan bases in the league that wanted a pound of flesh from James for his involvement in Draymond Green’s suspension. It came from the vocal group of James detractors, who were delighting in the possibility of the four-time MVP falling flat in the finals again, further proof in their eyes that he will never measure up to the unprecedented hype he received from his formative days in Akron, Ohio. 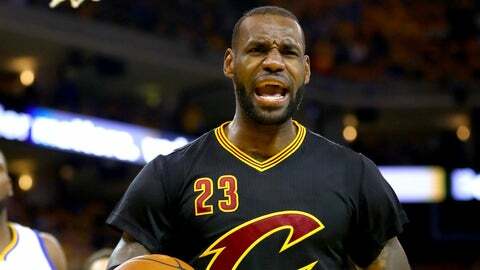 Facing elimination and a fifth career loss in the finals, James delivered a tour de force of a performance with 41 points, 16 rebounds, seven assists and three blocked shots in the Cavaliers’ 112-97 victory that pushed the series back to Cleveland. It was an emphatic response to three days’ worth of controversy. And as chaotic as it seemed from the outside, the 31-year-old James soaked it all in with the perspective born from 13 years in the pressure cooker. "I guess when you’re with the game of basketball and big moments like tonight and moments throughout your career, you wish you could get back," James said. "No matter how loud you turn the stereo system up in your house, you’ll never be able to get it back. You just don’t take these moments for granted, no matter if you’re at home or on the road." Mychal Thompson and Ayesha Curry mocked him. Marreese Speights essentially called him a baby, and the Warriors fans booed him mercilessly every time he touched the ball on Monday night. James insisted he heard none of it. Instead, he saw a weakened opponent and a chance to get one more game back in Cleveland, and he pounced. "My only motivation is how can I be there for my teammates and my coaching staff," James said. "That’s it. I mean, at the end of the day, nothing else really matters." It was an overpowering performance reminiscent of the 45 points and 15 rebounds he put up for Miami against Boston in Game 6 of the Eastern Conference finals in 2012. Only this time, James had a little more help. Kyrie Irving was sensational, scoring 41 points on 17-for-24 shooting to give the Cavaliers the first pair of teammates to score at least 40 in the same game in NBA Finals history. "It’s probably one of the greatest performances I’ve ever seen live," James said of Irving, who had struggled with his efficiency through the first four games of the series. "To put on the show that he did, you just go out and follow the keys and play winning basketball, and we did that tonight." The two of them got whatever they wanted against a Warriors defense that looked lost without Green, their emotional leader and defensive anchor. Green watched Game 5 from the neighboring Oakland Coliseum, serving the one-game suspension he received after hitting James in the groin in Game 4. Without Green in the middle, James bulled his way to the basket time and again. He also hit four 3-pointers and answered every Warriors push with a push of his own. "Over the course of this series, we’ve done a pretty good job of containing them and trying to force them into tough spots on the floor," said Stephen Curry, who had 25 points. "Tonight they kind of overcame that." James and Irving seemed to wear down in the fourth quarters of the first four games, the weight of carrying the Cavaliers offense with little rest sapping their energy as the Warriors kept coming at them in waves. But they faced little resistance defensively in Game 5, which helped them stay fresh all the way through. "Our defense wasn’t nearly as good as it’s been," Warriors coach Steve Kerr said. "So when you don’t play great defense for the first three quarters, your opponent isn’t going to be worn down in the fourth." Miami used James’ dominant performance in Game 6 in 2012 as a spring board to a Game 7 victory that propelled them into the finals. Now Cleveland is equally desperate and hoping for a similar effect heading into Game 6 in Cleveland on Thursday. "I think that the main thing is that we were able to give ourselves another chance," James said. "Going into Boston, being down 3-2, we understood that the season is over if we don’t go out and take care of business. "Being a big part of our success, I had to come out and do some things to help us win the ballgame, and tonight was just another example of that." Now it’s back to Cleveland. Green will be back in the lineup for Golden State, and the Cavs still trail in the series 3-2. But it’s not over yet, and they have James, Irving and maybe a few of those smack-talking Warriors to thank for that. "To repeat a performance like this would definitely be tough," Irving said. "But whatever it takes to win."